Purple wisteria blossoms are shown here within the precincts of Kameido Tenjin Shrine. The arched bridge was one of two such famous "taikobashi" in Edo, the one here in wood and the other in stone (see print 111 of the series). 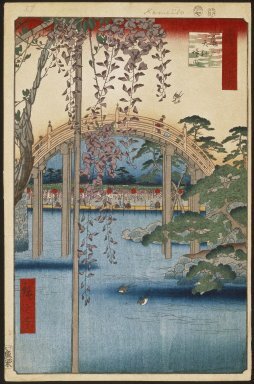 Hiroshige has exaggerated the height of the bridge above the pond, but not its steepness. Since World War II the bridge has been rebuilt in ferroconcrete. There is a printing error in the extension of the blue of the pond into the sky region below the bridge. The error was corrected in later impressions, but has led to many speculations as to how the mistake originally occurred.